This Lady Elise necklace is centred on a heart shaped Ethiopia Opal with red, green, yellow flashes deep within the stone, bringing colourful fire to the surface. The unique handmade sterling silver finding incorporates swirls and a stylised leaf, giving this pendant a life of his own. 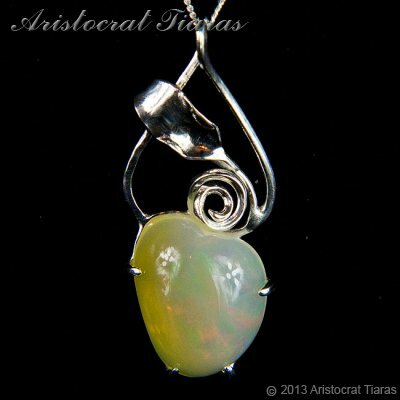 This Opal will turn transparent when absorb water. This handmade necklace from Aristocrat Tiaras is part of our Opal jewellery collection for one special mother of the bride or lady to enhance her outfit or makes a great gift for any special occasion!